France's foreign minister Sunday urged U.S. President Donald Trump not to interfere in French politics, following Trump's tweets on weeks of protests in Paris. 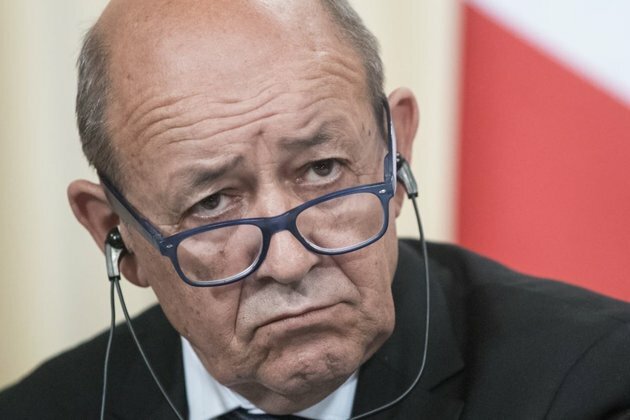 'We do not take domestic American politics into account and we want that to be reciprocated,' Foreign Minister Jean-Yves Le Drian told LCI television. 'Very sad day & night in Paris. Maybe it's time to end the ridiculous and extremely expensive Paris Agreement and return money back to the people in the form of lower taxes?' Trumps wrote. An earlier tweet from Trump insinuated that protesters in Paris sided with his decision to leave the Paris agreement - a landmark 2015 agreement between over one hundred countries to combat climate change. 'The Paris Agreement isn't working out so well for Paris. Protests and riots all over France. People do not want to pay large sums of money, much to third world countries (that are questionably run), in order to maybe protect the environment. Chanting "We Want Trump!" Love France.' he wrote. Nearly 2,000 people were arrested Saturday across France in the latest round of 'yellow-vest' protests. Nationwide, the interior ministry says some 136,000 people rallied against France's high-cost of living. Protesters also expressed their dismay with the presidency of Emmanuel Macron. Protests were held in a number of cities besides Paris, including Marseilles, Bordeaux, Lyon and Toulouse. France closed the Eiffel Tower and other tourist landmarks and mobilized tens of thousands of security forces for the fourth week of violent demonstrations. Many shops in Paris were boarded up before Saturday's protests to avoid being smashed or looted, and police cordoned off many of the city's broad boulevards. President Macron made an unannounced visit Friday night to a group of anti-riot security officers outside Paris to thank them for their work. The protests erupted in November over a fuel tax increase, which was part of Macron's plan to combat global warming. French Prime Minister Edouard Philippe called for new talks Saturday with representatives of the 'yellow vest' movement. He vowed the government would address their concerns over rising living costs. 'The president will speak, and will propose measures that will feed this dialogue,' Philippe said in a televised statement. Since the unrest began in November, four people have been killed in protest-related accidents. Government officials are concerned the repeated weekly violence could weaken the economy and raise doubts about the government's survival. The 'yellow vest' movement was named after the safety jackets French motorists are required to keep in their vehicles, which the protesters wear at demonstrations.